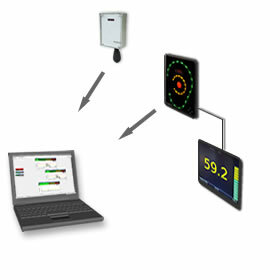 The noise monitoring system consists of LiveNoise Monitors, which can be connected to your Ethernet or WiFi network. The monitors can send measurements to a computer running the Supervisor software, or directly to a web server for access via our Web Reporter interface. Different types of Live Noise noise monitors can be mixed to create a custom system of indoor, outdoor or wall mounted devices. Pricing is simple and clear - you buy the monitors and the software is included. As connection is WiFi / Ethernet or through an existing computer on your network, there are no annual fees for GSM or 3G connection. You can also connect a monitor or TV to most of the LiveNoise modules to provide a large display of sound levels and high noise level alarms. All the indoor only LiveNoise modules have a suitable HDMI output.